"Built by Attorneys for Attorneys"
As attorneys, we know the importance of a good legal case management and portal. True organization and user-friendly technology have always been vital to running an efficient practice. But we also know how difficult it is to find the right software that makes things simple and effective. That’s why we worked hard to create something better than anything else on our market. But don’t take our word alone. Our testimonials glow about the unique advantage our portal has. No matter what industry someone is in, we all know how much better it is if your management software is made by people who understand your needs. We created and designed PrivyCounsel for people like us. For you. When you choose PrivyCounsel, you get the confidence knowing that your practice has the best resources that care for your clients. Times are changing. New technological innovations are changing the face of the working world across all professions. Changing times mean changing expectations from customers and clients. Today’s clients want access to their information 24/7, regardless of where they are. They want to be involved in managing their affairs. They expect that and they get it from their banks through online banking. They expect that and they get it from their doctors through applications likeMyChart. Many large companies allow their employees to self-manage their retirement accounts and benefits through companies like Hewitt, as well. Secure access is guaranteed on all these sites, so clients can peruse their confidential information, even on their smart phones with confidence. Where do we go to locate and update the status of pending legal matters? We make a phone call, wait for a letter in the mail, or schedule an office visit. These are not the best options for busy people on the go. The fact is many attorneys simply use email because its so convenient. Email is great for keeping in touch with people, but it’s not a secure way to transact meaningful business. Would you trust your banking to email? No? Then you probably shouldn’t trust legal matters to it either. Legally, personal email and its privacy belong to the service providers. Business email and its privacy belong to employers. Email is vulnerable to attacks and can be used to transmit viruses and worms. Conducting legal business via email is like performing surgery in an operating room that is not sterile. It’s also possible that email might not ever reach the client. Email addresses are unforgiving and easily misspelled. They can quickly become obsolete when someone changes jobs or internet service providers and unlike snail mail, there is no simple way to forward to a new address. Email messages could end up in a spam folder and the sender might never know it. Fortunately, there is another option: PrivyCounsel. PrivyCounsel is a secure web portal to allow live access to privileged information to both attorney and client. Its secure web architecture is perfect for folks on the go, allowing both the attorney and client secure live access to the most recent documents, continuously updated, on any pending matter from any location with web access. There is no hardware or software to buy and install. PrivyCounsel is a secure online service. Clients will appreciate the convenience of real-time access and the inherent transparency will help engender trust. The software, which has been developed with the active input of numerous attorneys, is so easy to set up; you can invite clients to log in five minutes after launching the program. A customized version, which is fully integrated with the look and feel of your existing website is also available. Estate attorneys, litigators, divorce attorneys, patent attorneys, any kind of attorneys--get with the program. Your clients will thank you. What Attorneys are saying about PrivyCounsel? "Most of my colleagues use one of the top 3 industry standard applications as their daily workflow. We have had discussions about how complex and expensive these tools are to use. In my professional experience, PrivyCounsel has a distinct advantage in it's simplicity, effectiveness, and affordability." "I had a client, he used yahoo email for years but then switched internet providers. He also changed jobs. All his prior emails were gone because he didn’t own them. Using PrivyCounsel solves the problem with the transiency of email. "We continue to discover new features that has significantly improved our practice. For example, the newer feature of time tracking has been a particularly valuable addition in that it allows me to track time by category of staff (attorney, affiliates, paralegals, etc). This feature has promoted accountability and transparency for my staff, and gives me a much better realtime picture of actual cost and profitability on each matter. "As a litigation attorney, I was concerned that the opposition in a case I was handling would try to hack me and my client's email. PrivyCounsel is the perfect answer." "I recently did an estate plan for a Chinese family. They’re U.S. citizens but travel to China frequently and for prolonged periods of time. Through the mobility and security of PrivyCounsel, we were able to complete their estate plan without delay or interruption without compromising their privacy." "PrivyCounsel is the perfect environment to transition our law office to the digital age. It not only provides the security we’ve lacked for years, it provides immediate access to client information, while improving efficiency and building a deeper client relationship." "I am able to securely access a record of client communications, internal office notes and files remotely on my mobile device." "I am in the process of opening up an office in another state. It will be staffed by an associate of mine. We will need constant communication and document collaboration in order for this new venture to work properly. I would not contemplate this venture without PrivyCounsel portal as our platform for secure, real time communication." "We usually send out documents to clients via email. Consistently, we receive complaints that they hadn't received their documents. When we check it out, we discover their documents go into their spam email. The client was upset thinking we didn't send their documents. We don't have this problem with Privy." "We keep pretty busy in our office. With our staff, client files are handled by several people. Even with a good file management or check in/check out system, files get misplaced. We sometimes spend hours, in fact, all work grinds to a halt while we track down a client file on occasion. With PrivyCounsel search all client matters are accessible in one place." "As an affiliate attorney working with several attorneys through PrivyCounsel, the ease of toggling between law firm accounts within the same environment is very valuable to me (without logging in and out). This feature allows me work on several projects for different attorneys seamlessly. Also, the time tracking features automatically tracks my time for each matter, for each attorney and makes my invoicing to each attorney much more efficient. And the attorneys can review my time on an ongoing basis." "My clients feel their information is safe and secure and they are comfortable communicating more openly." 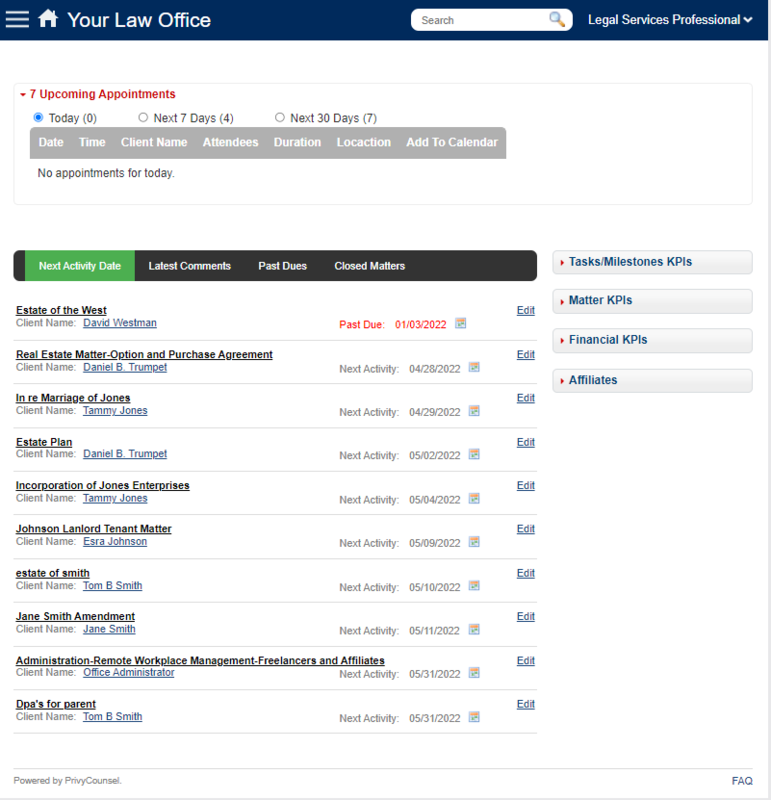 What Clients are saying about using law office portal? "PrivyCounsel provides the security we thought we had for years. It eliminates the use of employer email and changing email accounts. No more misaddressed emails or mixed with spam. No more worries of losing or getting locked out of my work email." "We love the direct line of communication to the attorney and our documents on our portal." "I stopped using work email and only use my secure portal with my attorney." What law office staff are saying about PrivyCounsel? "As a law office clerk, it can be challenging to navigate the inquiries from clients on a daily basis. We all understand that each individual case is unique in detail and timing. With PrivyCounsel, not only can we provide specifics, but we have real-time communication updates between client, attorney and front office staff. The document upload feature is an essential tool to our operations as well. Without it, the amount of time lost waiting on in-person delivery or mail would prevent us from serving as many clients as we do." "PrivyCounsel portal allows us to keep a permanent record of communications between staff and clients. There is no more, he said, she said." "PrivyCounsel prevents misunderstandings with transparent communication that holds everyone accountable on the client portal. If a complaint or disagreement is received we just share the "date stamp communication" on the client portal to refresh their memory." "PrivyCounsel provides an efficient and effective way of securely communicating with clients." Your client information is yours. When you cancel your subscription with PrivyCounsel, your client information will no longer be available through PrivyCounsel. However, prior to canceling, you may copy and or print all information onto your desired location if you cancel with PrivyCounsel. When you register with PrivyCounsel, there is a thirty (30) day free trial. You will not be charged any fees during this period. After the trial period, you will be charged fees in accordance with the subscription plan you sign up for. There is no contract period so you may cancel your subscription at any time. All information on PrivyCounsel can be copied and retrieved by you at any time. You remain in exclusive control of your client information at all times.